I want to thank all of you who have been praying for the California fires to subside and die out. Many of you have contacted me about the condition of Redding and its population. I have heard so many prophetic words of encouragement over the past few weeks, and I want to thank you for being the first responders of hope. In response, I decided to paint a picture of how the Carr fire has re-shaped our lives. These days in Redding, you can’t drive down the road without seeing signs, thanking the first responders and fire fighters. There are signs at gas stations, businesses, on lawns, and hanging on fences across our city. Yesterday, as I was getting groceries, a firefighter was in the line ahead of me ready to pay for his groceries. The cashier couldn’t talk because she was so moved by the way firefighters had risked their lives to save her home. Finally, with tears in her eyes, she said, “Thank you”, and paid for the firefighters groceries. My heart was also overwhelmed, and I became teary-eyed, as I watched this transaction of gratefulness in honoring those who deserve honor. These heroic acts of sacrifice so remind me of Jesus’ words, “Greater love has no one than this: to lay down one's life for one's friends.” (John 15:13). When we honor those who helped us in our time of need, our thankfulness expressed in overt acts paves the way for our breakthrough for healing. As this cashier expressed her gratefulness, her heart was being healed of the trauma she had gone through in being evacuated and almost losing her home. As believers, we are in the business of firefighting for the Kingdom, rescuing others from the devastation of the enemy. Like the firefighters, we go in to rescue those who may be in danger of losing their lives. Our mission is to save souls that are being threatened by the enemy’s schemes, weather it is a literal fire, or the flames of addiction, fear, and pain. As Creatives, our weapons may not be a fire hose spurting out water, but may be a paintbrush, pen, guitar, or our voice declaring life and hope through what we create! Just recently in church, I painted our state symbol, the bear, and standing in front of a cascading waterfall with new green life budding forth. In the background, I painted Mount Shasta prophetically declaring that Shasta County and Redding will rise again. and grapes will appear in our wine country. Just like I used my paintbrush and poem to prophesy over the devastation in my city, so we can become healers through our creativity to bring hope and healing to those God has put before us. Many of you may be wondering how believers who lost everything handled their loss. Here is a personal story from one of my artists, Diana Dorn, and how God met her in the aftermath of the fire. Two weeks after her house had completely burned down, her family went back to see the ruins of their house and began to look through the ash. Unbelievably, there laying in the ash were two pages from Diana’s Grandmother’s Bible fully intact from Psalm 89. There in the ash, her eyes were immediately directed to verses 8-10, which declares God’s rule over the surging sea as the waves mount up. All her family couldn’t believe these verses had remained from the fires because they held a special meaning to Diana. 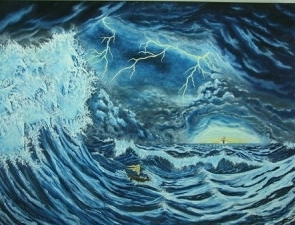 In the last 6 months, Diana had worked upon a painting with a small boat making it’s way through the surging waves of a deadly storm. Our entire arts community had watched her as she had painted this for months, and declared God’s promise towards her, as we hung it up in Bethel Church’s lobby for all to see. God was preparing her through her prophetic art piece to be ready for this storm, and to know that he would guide her through — that He was in charge. She wept with us as she shared the story because in the midst of this tragedy, she found God’s word literally in the ash! We will all face difficult times that may be out of our control, like the raging fires in Redding, but God promises to never leave us and to comfort us when we feel all is lost. It may seem like there is nothing left, yet, like Diana, God’s Word to us will remain. Let’s be like David who encouraged himself in the Lord (I Sam 30:6). When the enemy stole from him, he inquired of the Lord, defeated the enemy, and received back all that they had taken. In the same way, when the seas mount up and the fires rage, God surprises with His Word in season that has already been prepared for us to defeat the foes that face us. As we continue to recover from the trauma of the Carr fire, I am so undone by the beauty that we have lost around our city. Kevin and I went for a long car ride and just grieved over homes and forestry that has been lost. Even as we celebrate our firefighters and God’s protection over so many lives that were spared, all of us continue to grieve over lost lives, homes and forestry, believing in hope that God’s creative goodness will become our new normal, even as we look at the devastation. We know that God’s Kingdom will come from Heaven to earth once again to bring beauty out of the ashes. This is what we are already seeing in Redding in the many ways people are reaching out to each other, grieving, sharing prophetic signs, and celebrating God’s goodness together throughout our community like we have never seen before. Our community, resiliency, and hope in God’s goodness have come forth through the fire. These are what we hold on to. These will bring us out of the ashes!